Located in the beautiful cotswold town of Woodstock, surrounded by breathtaking countryside, there are many independent shops nearby, plus Blenheim Palace is just a short stroll away! Woodstock is a picturesque, historic market town with a difference, thanks to its immediate, on-foot access to Blenheim Palace, a World Heritage Site often referred to as Britain’s greatest palace, and the birthplace of Sir Winston Churchill. The Palace is just a 20 minute walk from the hotel. Visitors to Woodstock get to enjoy not only the amenities of a bustling town, but also the iconic history of the famous palace and its 2,000 acres of Capability Brown landscaped parklands. A walker’s paradise, the grounds of Blenheim include a great lake, beautiful formal gardens and plenty off-the-beaten track rambles. You may even stumble upon the Temple of Diana, where Churchill proposed to his future wife Clementine. Woodstock town is a collection of easy-to-explore historic, honey-coloured streets as lovely as any found in the Cotswolds. Wander in and out of interesting boutiques, unique art galleries and antique shops. The Oxfordshire Museum (2 minutes away) in the heart of town tells the story of the ancient county, it’s natural history, Roman developments and archaeological sites. When you’re ready for a break, enjoy eclectic food choices in one of the many tearooms, coffee shops, pubs or high-end restaurants. 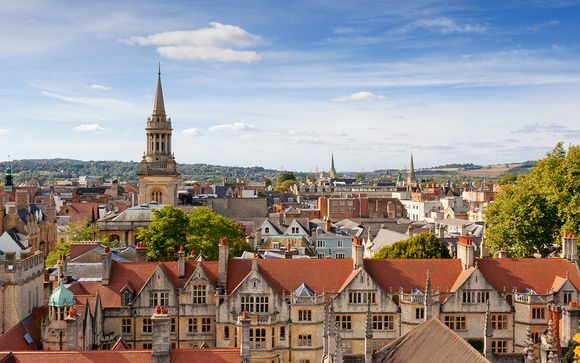 Located just eight miles north of Oxford, Woodstock is ideally situated for visiting the great academic city, but also for visiting many other sites of interest, including Rousham House and Gardens (5 miles away), the ethereal abandoned village of Hampton Gay (6 miles away), and more. You're also just a 20 minute drive away from Bicester Village - the famous designer shopping village where you can find amazing discounts on a whole host of glittering name brands - Ralph Lauren, Gucci, Prada and much more! 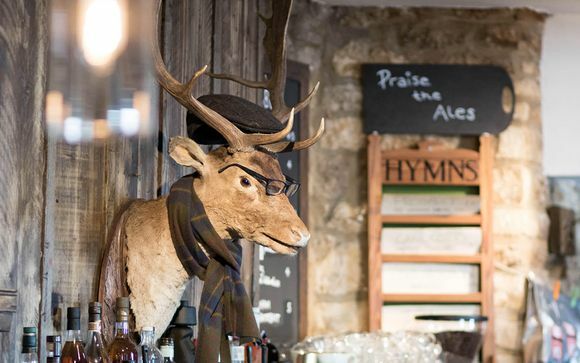 Woodstock Arms is the perfect Cotswold retreat, boasting rustic interiors, wide plank floors, a restaurant with locally sourced ingredients and terrace to enjoy al fresco dining. The rooms all come with individual style and en-suite facilities, as well as quirky touches evoking a fun and friendly British sensibility. Comfort, style, location and culture all come together at the Woodstock Arms to give each guest a memorable stay. All of the hotel's brand new rooms are luxuriously furnished with modern day touches to allow you to have a comfortable stay. From Hypnos™ beds to Egyptian cotton sheets and towels, they have added all the extra touches that make a difference to your visit. 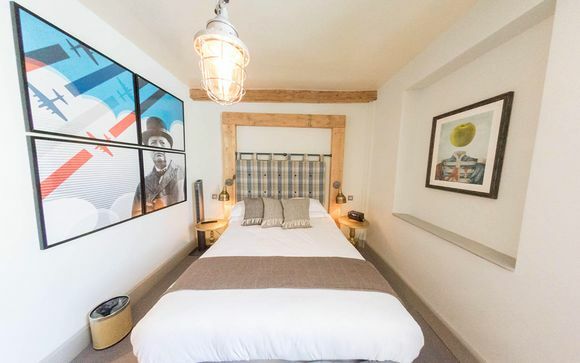 Each room has a quirky, modern contemporary design which enhances the natural features of the historic Inn and most rooms look out over the historic Market Street of Woodstock. The Woodstock Arms aims to serve the best in traditional English food. As well as main meals, they have a great snack & light bite menu which can be enjoyed in both the pub and courtyard. The beautiful, sunny courtyard is perfect for dining al-fresco, or just enjoying a glass of wine or a pint on the terrace.